Bookmans is a popular hang out for creative and artistic types. We think of it as your Third Place. It is hard to predict what you may find or who you may meet at any of our seven locations. In the few years that I have been an employee, I have met Grammy winning musicians, prolific authors of inspiring fiction and countless fanatics of all things artistic. Recently, I met a relative of one of my favorite artists and want to share the experience. Although not a Tucson native, Keith Parkinson lived in Pima county for a few years. If his name does not ring any bells with you, you may recognize his work from our shelves. 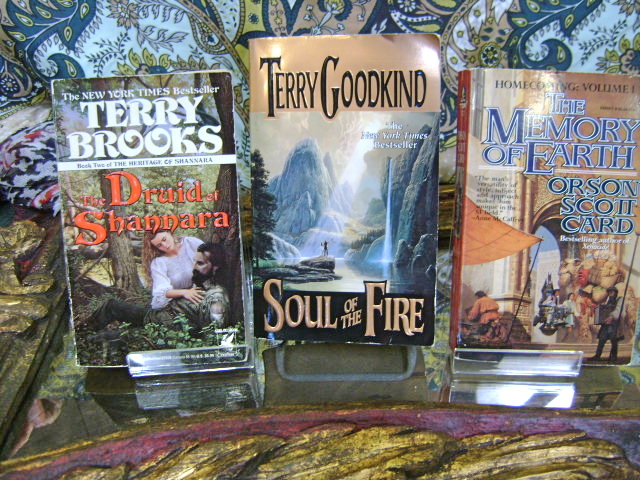 Perhaps most well known for his work with Sony on the game Everquest, Parkinson was responsible for the cover art that accompanied the work of authors such as Terry Brooks, Orson Scott Card, Terry Goodkind and Anne McCafferty. If you have seen anything related to Dungeons and Dragons, you have more than likely seen his work as he worked for TSR for 5 years. When I see a 700 page book like that of Terry Goodkind, I am curious about the contents. My first impression of a book is the cover. I appreciate the large spaces depicted in Parkinson’s work. A vast canyon barely accented by a black robed monk or an expansive tower that reaches into the clouds are only descriptions that do no justice to his honest and natural talent. I have seen no other visual artist who better depicts fantasy fiction better that Keith Parkinson. Sadly, in 2005, Parkinson passed away at the much too young age of 47 after a battle with Acute Myelogenous Leukemia. His work lives on. Visit his website, enjoy his work and take the time to be inspired.